Meet fellow Petaluman Jeff Maddux of newly formed Vinformativ: “Information Management” provider to the Wine Industry. Jeff is proud as punch to be partnering with wine business executives and world-wide information technology staffs in order to function as a global wine industry techno strategist! "Our focus is to work with wine business entities to understand their needs and advise them on how best to use technology to accomplish their objectives," says Jeff, who has launched Vinformativ in order to better evaluate technology products and vendors to establish strategic wine industry alliances with providers of leading-edge software solutions. Creating a cutting-edge portfolio of best-of-class wine industry technology offerings, Vinformativ advises wine business clients as to which specific state of the art technologies to select to help them achieve their objectives of efficiency, profitability and sustainability. Executive Director of the Petaluma Gap Winegrower's Association, Jeff has extensive knowledge and hands-on experience within the wine industry and a diverse and impressive background in information technology. Winemaking is his passion in life, and you'd be hard pushed to find a more detail-oriented individual in which to trust your winery technology needs than Mr Maddux. 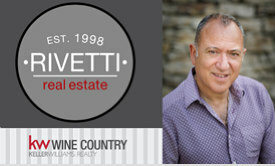 Wine industry readers can find out more about next generational affordable and easy to use winery software such as VINx2 by picking up the phone and giving Jeff a call at 707 479 8976, or emailing him at the Vinformativ link above.